Every one of Novotechnik’s TP1 Series of magnetostrictive position sensors come with one vital thing that’s not in the specs and is equally important – unmatched technical support. 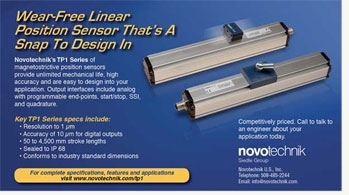 Novotechnik's TP1 Series of magnetostrictive position sensors provide unlimited mechanical life, high accuracy and are easy to design-in to your application. Output interfaces include analog with programmable end-points, start/stop, SSI, and quadrature.